Our team researched and compiled a list of the 10 best Victorian dresses for the mother of the bride for you. Here are our thoughts. We all love our mothers and want them to look their best, however, sometimes it is hard to strike a balance between what the bride wants and what her mother will consent to wear. Recollections is owned and operated by women which gives us a unique understanding of the difficult and stressful situation this can turn into for both parties. Are you a bride looking for a mother-of-the-bride dress you like that will make your mother happy? Are you a mother of the bride who is tired of turning down garments that you know will look unflattering on you? We invite you to sit back, take a deep breath, and let us help you effortlessly sort out one of those difficult wedding decisions. You can’t go wrong with a fancy Victorian suit! 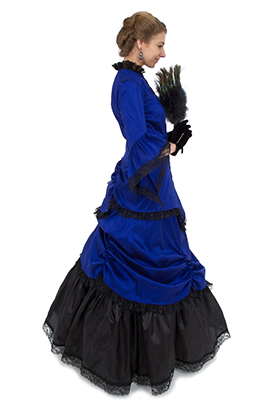 This dress is made of a rich taffeta fabric and features a stunning bustle effect throughout the jacket and skirt. The Corrina is the perfect balance between elegant and simple, what could be more suiting for the mother of the bride? 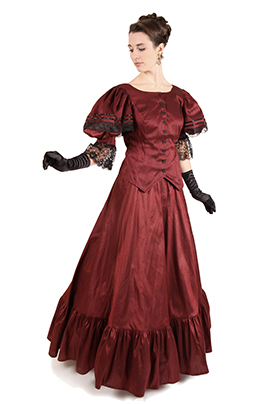 This elegant ensemble is styled after the late Victorian era and has major class! The Caprice features a buttoned front closure, a flouncing underskirt, lovely lace, and bustles. It is made of a beautiful dupioni fabric which functions well year-round. Any mother of the bride is sure to look classy and refined in this dress! The Anastasia is the dress for the sophisticated mother of the bride. 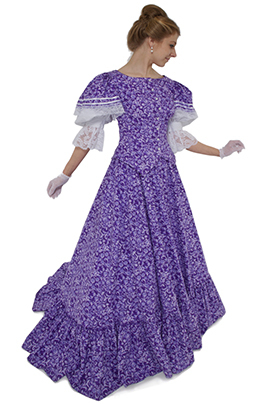 It is made of a luxurious taffeta fabric and features generously gathered ribbon and lace sleeves. The back of this lovely dress is equipped with bustle ties and can be worn bustled up or left down in a short train. This dress is perfect for any mother of the bride who wants options, and it is sure to make her look and feel stunning! 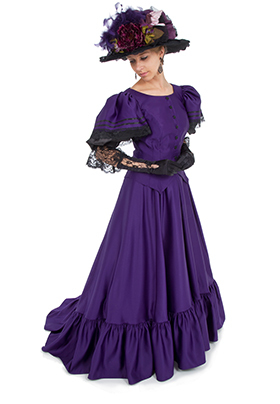 This ensemble offers many of the same great features and functionality as the Anastasia, including the bustle/train option and gathered sleeves. However, it is made from 100% cotton calico fabric making it breathable and perfect for an outdoor spring or summer wedding. The ribbon and lace trimmings add a delicate touch that makes this dress positively graceful. Any mother of the bride would look gorgeous in the Linette! 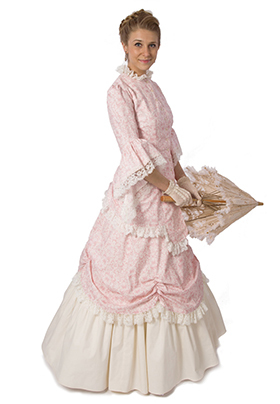 The Lara features a 19th-century style jacket with poufed oversleeves and a gracefully flounced skirt. The skirt is made with an elastic waistband and can be bustled up in back if desired. This dress is made from a beautiful polyester dupioni fabric which gives it a look of luxury with a feel that adjusts well year-round. 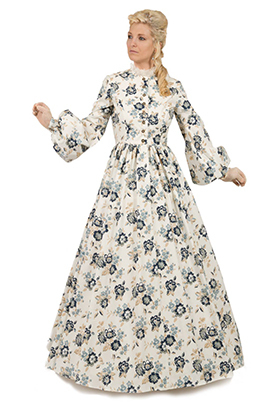 Spring or fall, bustles or no bustles, this dress gives you the best of both worlds and will make the mother of the bride effortlessly ready for whatever the day may bring! This feminine and captivating dress is ideal for the mother of the bride. The Patience is made from a lovely 100% cotton calico and has the perfect hint of lace. The trimming, flounces, and bustles making up this garment create an enchanting and delicate look. This dress is sure to exemplify the charm of any woman wearing it! 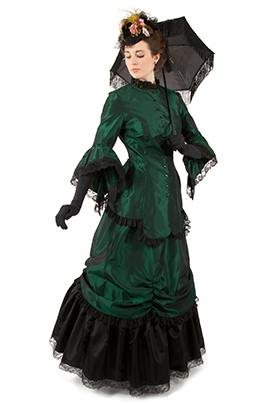 This mid-19th -century Victorian gown is classic! The high neckline featured on the Penelope dress gives it an air of modesty and propriety, while the calico and lace give it a warm and delightful look. The perfect balance! This dress is sure to leave any mother of the bride feeling perfectly prim and proper. This eye-catching suit is simply elegant! The long sleeves, flared peplum top, and lusciously long skirt are the perfect combo for a wonderfully tasteful looking mother of the bride. 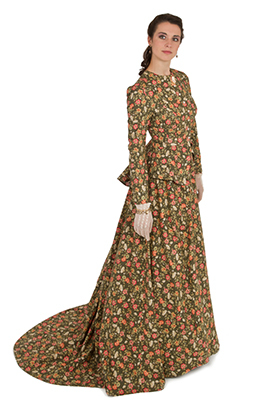 A gorgeously long train trails behind this dress and can also be bustled up if desired. This gives the Lavinia extra points for functionality. A mother of the bride wearing this calico beauty is sure to be a lovely sight to behold! The Bethany is a simple but divine dress that enchants the wearer and all who see her. 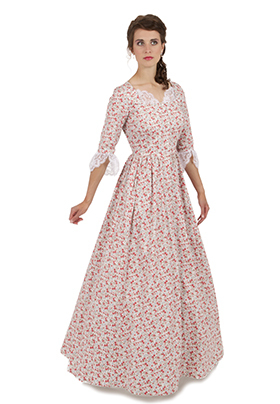 It is made of a calico fabric and features a square neckline, lovely lace eyelet, and POCKETS! Crying mother of the bride? No worries, this gown can hold all the tissues you may need! This beautiful dress will surely put a spring in your step! Perfect for any spring or summer wedding, the Eliza is made of 100% cotton calico and features three-quarter length sleeves, a captivating square neckline, and some ever-so-useful pockets. The lace on this garment adds that extra touch of elegance and gives off an air of femininity. A mother of the bride will look radiant and glowing in this gown! We hope you enjoyed our Top 10 Victorian Dresses for the Mother of the Bride (or groom). 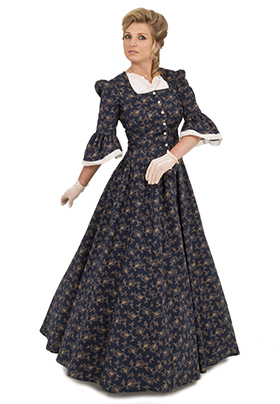 We have these and many other styles from the late 1700s through the 1920s and 1950s, too. Stop by for a visit soon!